Aerodynamicists use wind tunnels to test models of proposed aircraft and engine components. During a test, the model is placed in the test section of the tunnel and air is made to flow past the model. Various types of tests can be run in a wind tunnel. Some tests are performed to directly measure the aerodynamic forces and moments on the model. The most basic type of instrument used in this type of testing is the force balance. To measure the force, we use some type of mechanical or electrical system whose output changes when a force is applied to the system. For rather simple, student-built wind tunnels, a mechanical spring gage may be sufficient to determine the forces on the model. Multiple gages can be used to determine the three forces and three moments present on the model. 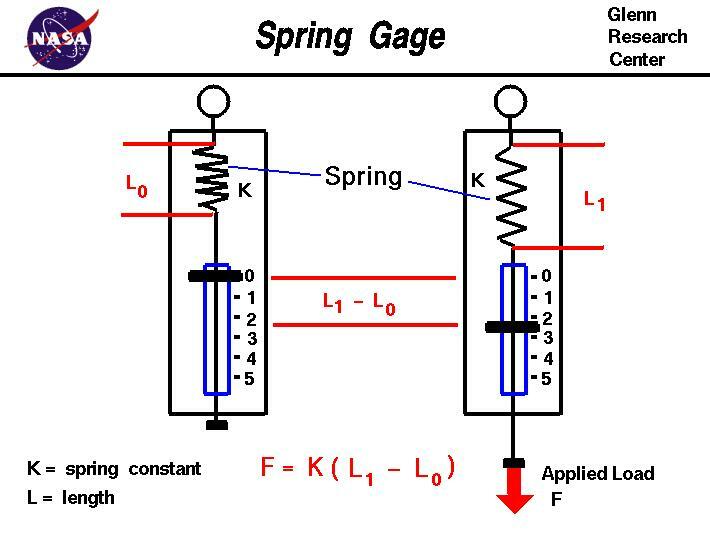 On this web page we will examine the operation of a spring gage.